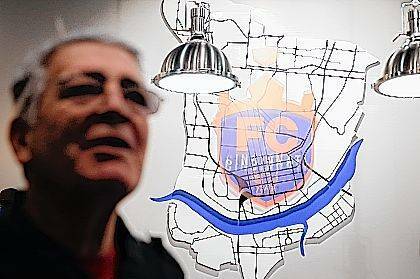 CINCINNATI (AP) — Political and business leaders in Cincinnati are pushing toward their goal of scoring a Major League Soccer franchise, while in Ohio’s capital city, soccer supporters are on defense. In a few years, Ohio could have two MLS teams. Or still just one. The 22-year-old league’s growth plan got shaken when the owner of the Columbus Crew, one of its 10 original teams, announced in October he could seek to move the team to Austin, Texas, if Columbus can’t come up with a new stadium in a downtown location. Columbus Mayor Andrew Ginther has expressed frustration with lack of commitment from the league and Crew owner Andrew Precourt to keeping the team in his city. Ginther is a Democrat, as is his Cincinnati counterpart John Cranley, cheerleading the effort to land an MLS franchise in a city that has embraced its United Soccer League FC Cincinnati with record-breaking attendance figures for the second-division league. Cranley predicted at a city council session Monday that supporting the expansion bid will prove to be “a historic no-brainer,” citing league growth around the world’s most popular sport. Cincinnati officials Wednesday committed to funding of some $36 million for road and other infrastructure improvements to support a proposed new soccer stadium for the FC Cincinnati team, which has been playing home games in the University of Cincinnati football stadium. Hamilton County commissioners Wednesday agreed to $15 million for a parking garage. The ownership led by Carl Lindner III, of a prominent, civically active Cincinnati business family, has pledged to cover privately the $150 million league admission fee and expected stadium cost of some $200 million. 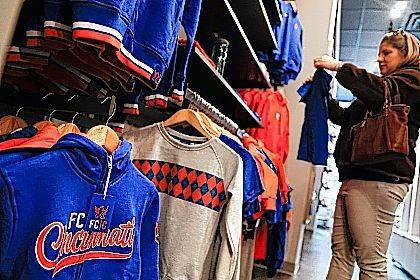 “It’s exciting to think of that happening,” Lisa Everson, 36, said about a MLS team as she picked out FC Cincinnati gear for children’s Christmas presents in downtown Cincinnati. Some remain wary of putting any taxpayer dollars behind another sports team, especially with lingering resentment over taxpayer financing agreed to two decades ago to build a new football-only stadium for the NFL Bengals, under threat of the team leaving town. Taxpayers then funded the Major League Baseball Reds’ new stadium. 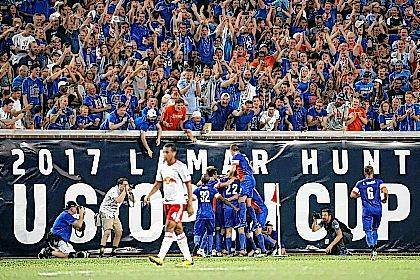 MLS averaged 22,000 in attendance for the first time in its history this year. From 22 teams last season, MLS plans to eventually grow to 28. Two expansion teams for 2020 will to be chosen later this month from four finalists MLS announced Wednesday: Cincinnati, Detroit, Nashville, Tennessee, and Sacramento, California. The Columbus Dispatch reported recently that the city, with no immediate prospects of funding a new stadium for the Crew, has been told that should the Crew move, Columbus would get consideration for a new team in the next expansion round. Hopeful about Cincinnati’s chances is Carlos Martino, 74, a native of Argentina who lives near Cincinnati. He’s a veteran fan who’s been to multiple World Cup games as well as FC Cincinnati matches. He referred to the local soccer team’s successes compared to the Reds’ and Bengals’ struggles in recent years. Follow Dan Sewell at http://twitter.com/dansewell.